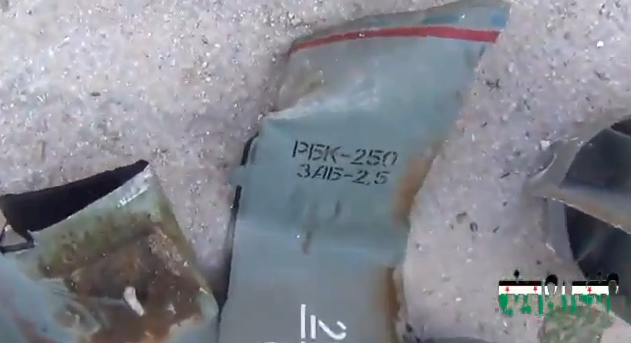 RBK-250 cluster bombs, containing ZAB-2.5 submunitions, have recently been identified in Syria. 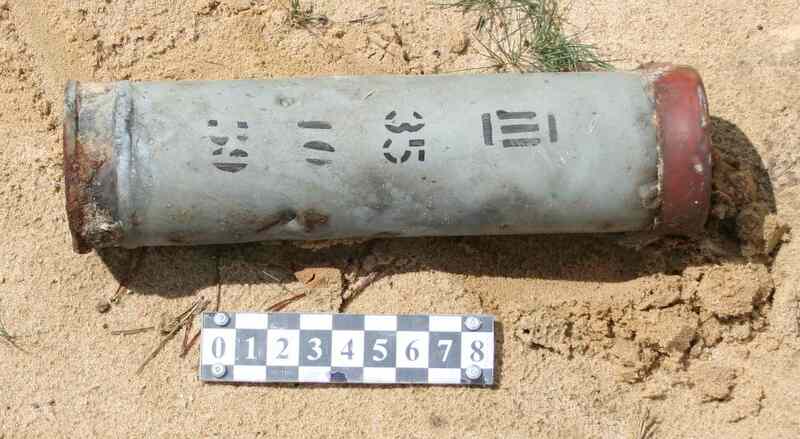 There has been a lot of confusion surrounding both the cluster munitions themselves, and the submunitions, with contrasting and conflicting claims. First and foremost, it is important to note that the RBK-250 ZAB-2.5 250kg cluster bomb, as sighted in Syria, contains three different variations of ZAB-2.5 submunitions: one with an incendiary (thermite) composition, one with a thermite + high explosive composition, and one with a thermite + jellied incendiary composition. ZAB (Zazhygatelnaya Aviatsionnaya Bomba; incendiary aircraft bomb) series weapons include a range of unitary incendiary bombs as well as submunitions (AKA ‘bomblets’). The RBK-250 ZAB-2.5 cluster bomb contains 48 submunitions in total, with 16 ZAB-2.5 variation 1 submunitions, 16 ZAB-2.5 var.2 submunitions, and 16 ZAB-2.5 var.3 submunitions. 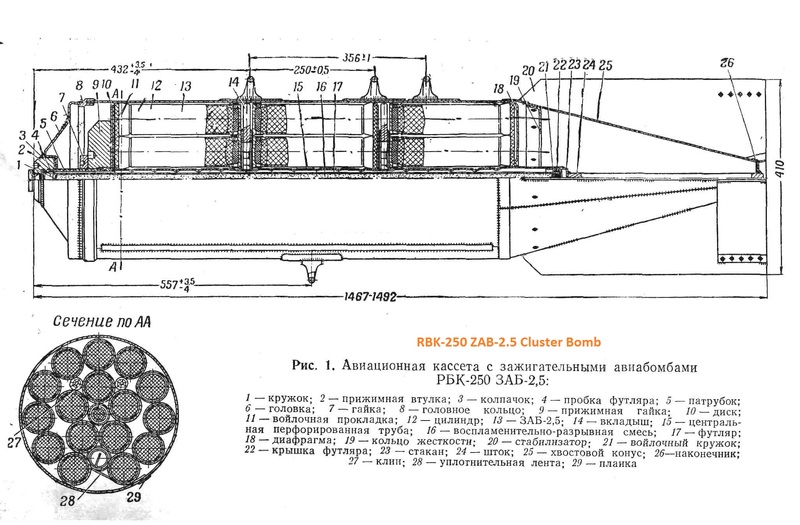 The bomb itself will be marked ‘RBK-250 ZAB-2,5’ as seen in the image below (rotated for ease of viewing). Its nominal weight is 250kg (hence the ‘-250’ designation), with an actual ready weight of approximately 194kg. The bomb is 1467-1492mm in length, has a body diameter of 325mm and a wingspan diameter of 410mm, and contains a 0.7kg explosive separation/ignition charge. Variant 1 – weight: 2.3kg; thermite; approx. burn time: 150 – 180 seconds. Variant 2 – weight: 2.5g; thermite + PETN bursting charge; approx. burn time: 120 – 180 seconds. Variant 3 – weight: 2.2kg; thermite + jellied fuel mixture + PETN bursting charge; approx. burn time: 3-9 mins. Variants 2 and 3 also contain PETN (тэн) bursting charges, designed to disperse the incendiary composition, and to discourage and impede attempts to extinguish the burning submunitions. These charges are initiated by a pyrotechnic block delay, after the submunitions have reached the ground and burned for some time. In the case of Variant 3, this charge has the added effect of dispersing the napalm-like filler over a wide area, after the thermite portion of the submunition has burned down. The thermite component of the submunitions is capable of penetrating 3-4mm of steel, and igniting combustible materials. The ZAB-2.5 submunitions are ignited upon ejection from the RBK-250 ZAB-2.5 and fall down burning. This ignition process remains reasonably reliable over time, unlike the fuzes seen in some other cluster bomb submunitions identified in Syria, such as the AO-1SCh, however dud munitions are still likely. Incorrect employment of the munitions, such as unsuitable ejection height or speed, may also contribute to an increased dud rate. Thanks are due to Yuri Lyamin, Ivan Kochin, and Alex Diehl for their assistance. The diagrams are from an official Russian publication, annotated in orange by the author. The topmost photo is of unknown copyright, and is not from Syria. Should you see any further examples of ZAB-2.5 cluster munition use in Syria, or have any other information to contribute, please get in touch with me. Update 28/11/2012: The video below shows what is likely the aftermath of a strike with ZAB-2.5 submunitions. 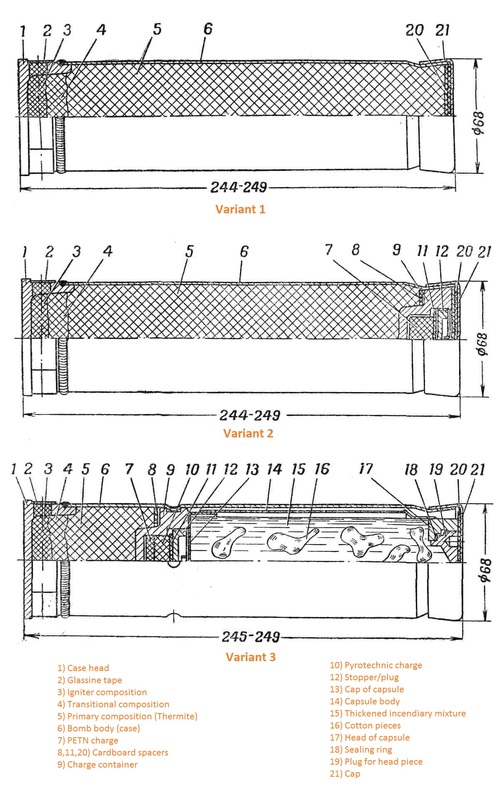 Note submunition casings. Update 4/12/2012: Another very good video showing ZAB-2.5 casings and RBK-250 ZAB-2.5 bomb remnants. Update 6/12/2012: An excellent video of ZAB submunitions igniting upon dispersal, and falling near Deir ez-Zour. (H/t Bjørn Holst Jespersen). Looking forward to identification of the bomb used on that “playground” in Deir al Asafir on Sunday, killing about 11 children. The casing and markings are quite similar to these shown, but not quite the same. See my website link for useful stills and probably useless interim thoughts. The use of incendiaries as a replacement or substitute for a proscribed ‘terror’ weapon is not unusual. It occurred in Gaza with the widespread use of WP during Cast Lead in Jan 2009 following the international response to the use/overuse of cluster munition in S. Lebanon in 2006. Perhaps the use of such munitions should have been anticipated.